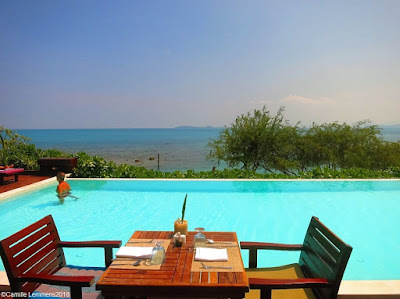 Here's a personal list of Top 10 Romantic hotels on Koh Samui in no particular order. These are hotels and/or resorts that I have been to myself, I may have stayed there overnight or have visited at least once but more likely I have visited a couple of times. Have a read, enjoy the list and my scribblings, comments and remarks and please, by all means, leave your feedback with your own comments, suggestions and experiences in the comments section. Tucked away in a curve between Maenam and Bophud is Zazen Boutique Resort & Spa. The original resort was a local family owned affair with some wooden huts on the beach. Ti, one of the children of the Zazen family owners, married a Belgian guy, Alexander and they both build this truly Boutique resort that hosts an excellent restaurant and can hold itself easily in this top 10 of romantic hotels on Koh Samui. Great location, good prices and fantastic food with a very intimate atmosphere. Around the corner of where we live is one of the longest established five star resorts on the island, the Tongsai Bay hotel. After all these years they can easily keep up with all the other resorts in the same five star segment. Located in a private bay, you will be pampered in their villas or rooms with a great view over to Choengmon beach at the north east corner of the island. This resort comes with a price tag though. although it's a well deserved tag! If you're looking for a romantic and secluded stay, U at Koh Madsum is as good as it gets. This lovely island, Koh Madsum, accommodates only this resort and it's well worth a stay. Just South of the South Western point of Koh Samui, you can only get there by boat and be rewared with the tranquility of the empty beaches. Great rooms, locely atmosphere, a real gem and you're hidden from the rest of the world! Enjoy this great experience. A real stunner in this list of top 10 romantic hotels in Koh Samui is the Four Seasons Resort Koh Samui. If you have ever been to a Four Seasons Resort before, you know the high standard that is common use here and if you haven't, this is as good a time to have a first encounter and experience. with a Four Seasons Resort. That is, providing your wallet can afford it! However, if that's taken care of, you can enjoy private villas and swimming pools with stunning views and private and exclsuive beaches with great restaurants on site. No real need to leave the premises. Back up to the North of the island we have in Maenam the W Retreat, just a stone throw away from Zazen, mentioned earlier in this blog. Hip, trendy and a great place to spend time with a loved one at the private pool retreats or at the six restaurants. The W Retreat will most certainly try to make your stay a memorable one. In the northeastern part of the island, in Choengmon we have a hidden gem and the hottest and best place to stay currently in this area, check out the Sala Samui Resort & Spa, where 53 out of 69 total of villas and suites feature their own private pool. A very romantic setting at Choengmon beach with plenty of other attractiosn and locations at your fingertips. Time to hit Chaweng, the busy center of Koh Samui, with it's night life, restaurants, beach and shopping opportunities. First off the New Star Beach Resort, just outside of all the hustle and bustle that Chaweng offers, on a secluded beach, located on the road which eventually leads to Lamai. A little bit more quiet and still close to all the action. A great location and environment to enjoy a romantic stay on our island. Near our house in Plai Laem is one of the finest luxury stays on the island, Six Senses Hideaway Samui. What's in a name? Hideaway galore it is on this vast area of land that houses this Hideaway with private villas and pools, healthy food and great views over the ocean and towards Koh Phangan. Class, style and did I mention luxury yet? Very nice and romantic, guaranteed to leave an impression. Last but not least we head down to Lamai and on it's outskirts we find the Silavadee Pool Resort & Spa, a privately owned resort on a small land 'finger', overlooking the Lamai beach area. Their almost private beach is so secluded that they had the first turtle eggs being laid on a Koh Samui beach since 21 years. Lovely atmosphere, beautiful rooms and villas, great scenery and a small but pretty much an exclusive beach. Very romantic indeed.